With materials like aluminum and Post-303 stainless steel and processes ranging from turning and milling to engraving and anodizing, we manufacture light guide stands for the semiconductor industry at SyntecOptics.com. Wordingham Technologies manufactures light guide stands for the semiconductor industry in Ontario, Canada. These basic stands, with manual adjustments, are based on customer-provided 2D CAD drawings. Using aluminum and Post-303 stainless steel, our fabrication process includes CNC turning, milling, engraving, anodizing, and then assembling all the parts. The resulting stand consists of a light guide adapter holder, a 90-inch bracket, a scale, stage, and a base. 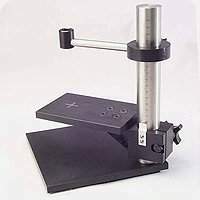 The base measures 8 x 8 inches, with a height of 10 inches, and all components are packaged individually based on the customer’s specifications, weighing approximately 10 pounds. Contact us to learn more about our custom optics manufacturing capabilities.